Christina telling Caroline that if she cared about her feelings at all, she'd support her and say yes to a modelling job. Doug and Cody have put their tent up in no time. Unfortunately, Jim and Todd aren't having much luck – they've left the frame and tent pegs behind! 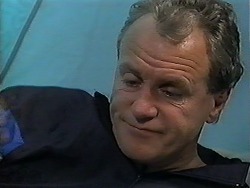 Jim offers to go back and fetch them, but Doug reckons they can all squeeze into his and Cody's tent. Cody and Todd look impressed but Jim insists on going back. However, Doug thinks it's a waste of time and suggests some sight-seeing. Jim agrees. Christine approaches Caroline. She says that Paul was waiting for her to say goodbye. They talk about the modelling. Caroline won't do it because they want the “twin gimic” and if Christine has any sense she'll be on the plane home tomorrow with her. Christine wants Caroline to play along – so that she can show what she can do. Caroline refuses. Christine: I don't think you can stand the idea of me being a success in my own right, can you? Caroline declines this. She's more worried that Christine in too naive about this kind of thing and will just be used. Christine retorts that she's only naive because Caroline stops her from doing anything interesting. Paul's come over to see how Melanie got on in his absence. And...everything went without a hitch. She even got him an appointment with the people that he'd been trying to speak with for ages. Success. The only thing to go wrong was that a wedding party cancelled, but she was able to reorganise for a birthday party in it's place. Paul's astonished. Paul: What can I say? You are worth your weight in gold. 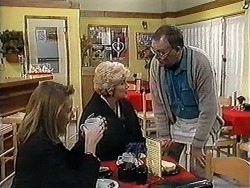 Harold's playing with Sky while Madge is telling Kerry and Joe about the plans she has for the Coffee Shop. Perhaps a theme or something! Harold, however, isn't keen. Kerry relays her plans to Madge about enrolling Sky in a playgroup as the new baby is taking up a lot of her time and Sky needs to make some friends. Madge takes Harold home for dinner. Joe: Some people. All they can think about is their stomachs, eh? (laughing) What is for tea? Doug, Cody, Jim and Todd are tucking into some very unappetising food! Doug tells Jim to stop worry about the tent. Jim says he's disappointed that he spent $120 hiring out a tent he'll never use. Doug says that he's done much worse than that himself! He tells Jim not to worry about it. Caroline catches up with Christine about her job interview. Did she get it? Did she sign the contract? Christine's bitter because Caroline was right – all they wanted was the “twin gimic”. Caroline says that at least now she knows. Christine looks unhappy. Jim, Doug, Cody and Todd are all squished into their sleeping bags. Todd and Cody are laughing – Todd feels like in a minute someone is going to reach down and spoon them onto a slice of toast. Interesting...! Doug tells them to be quiet; the next person to speak will be getting breakfast for everyone tomorrow. Later that night Jim looks mighty unimpressed at Doug's snoring. He tries to roll him over, but eventually settles for putting his head under his pillow. In the morning, Doug is the first up and Todd tells Jim that he can't sleep all day. Jim looks as though he had a bad nights sleep. Cody says she slept well but did wake up to someone snoring, Doug says the same and Jim says not to look at him! They all get moving for the day. Madge is sitting with Melanie tries to suggests to Harold that they do hot breakfasts in the morning for people on their way to work. Harold points out that she'd have to get up very early, and that it's the ‘joggers' that go to them – and they want the healthy stuff. Tanya come sin. Melanie explains to Madge that Des thinks she should try acting like a big sister and not a mum to her. So...that's what Melanie does. She goes to speak to Tanya. Tanya says that she has to go dress shopping for a party, but needs something cheap. Melanie suggests she borrow one of her dresses. Tanya seems keen. Hoorah! 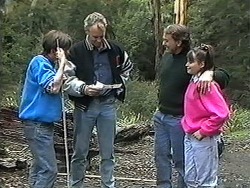 They're interrupted by Paul who wants Melanie to bring him a coffee. Paul leaves and Melanie suddenly remember the imitation of Paul on his desk – she runs out of the Coffee Shop, in the hope that she'll get to it before he does! Melanie: If he kills me, you can have all of my clothes! Kerry and Joe like it and agree to put Sky there. The woman asks for some particulars. She has their home number, but perhaps a work number for “Mr Bishop” (Joe). Kerry says Joe is Sky's stepfather. The lady asks for a number for the natural father - as it might come in useful but Kerry says that she isn't in contact with him at the moment. Jim and Doug are walking, but Jim is breathless. He says he'll stop and take some photos, but Doug should catch up with the kids. 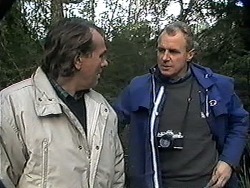 Doug makes sure Jim knows the way and then leaves him leaning against a tree. Melanie is frantically searching for the Dictaphone while Paul is on the phone. When he get soff the phone he isn't happy with all the “rummaging”. She finds it, but Paul makes her hand it over. He listens and she cringes, creeping out of the door behind her. Paul isn't impressed. Paul gives the Dictaphone back to Melanie. Isn't he going to say anything? Well, no. She did a good job while he was away and he was thinking of promoting her anyway. She's just lucky he still has a good sense of humour. Christine and Caroline march in. Melanie asks them how it was, but they don't want to talk about it. Caroline looks angry with Paul. She and Paul disappear and Melanie asks Christine what's going on. She tells her the whole story about Paul wanting them to model etc and how she wants to model. 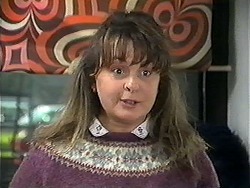 Melanie tells her to go for it and Christine says that she will – and then pulls out a present for Melanie, it's a whale. 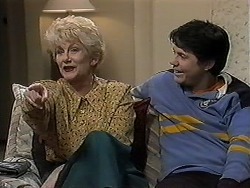 Madge asks Kerry and Joe how the playgroup went. Kerry says it went well, that's where they'll go to. Sorted. 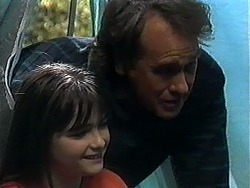 Madge observes that Joe looks a bit down, and after some persuasion, he admits that it's the whole situation of him being Sky's step father. He wonders what Kerry things of him adopting Sky. She thinks it's a wonderful idea. Hoorah! However, they should get in touch with Eric, Sky's natural father, just to let him know. Joe looks unimpressed but Kerry assures him that it won't change anything. Tanya has found the perfect dress out of Melanie's collection. The two of them look happy. 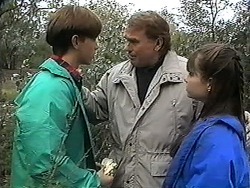 Tanya apologises for her behaviour before – she was just worried her Dad was rushing into things. She explains that it was very soon after Mum broke things off with him. Melanie is confused – she thought Roger broke it off. Well, apparently not. It's Tanya's mum who is filing for divorce. Uh oh. Doug returns to Cody and Todd – there's no sign of Jim. Todd's worried as Jim didn't look too good this morning, but Doug says he's sure he's fine – he just took a wrong turn. Todd says he's got a really bad feeling that something's wrong, but Doug reassures him that Jim could have even just fallen asleep somewhere and they're not to worry. He'll be fine. 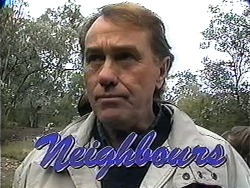 Doug then steps away from Todd and Cody with a worried look on his face.